Robertson's Skin Repair Ointment provides symptomatic relief of eczema and dry inflamed skin conditions. Itching is caused by extremely dry skin. 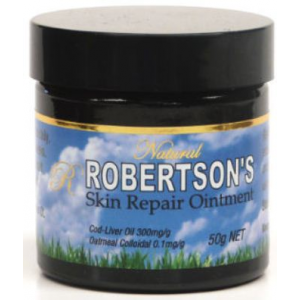 Robertson’s Skin Repair Ointment is a very thick ointment and it’s deep moisturising action helps to stop the itch. The active ingredients help to protect and repair the skin. Cod Liver Oil contains Omega 3 Fatty Acids; E.P.A. (eicosapentaenoic acid) and D.H.A. (docosahexaenoic acid). Colloidal Oatmeal contains Aventhramides. Together, these natural active ingredients help treat dry, inflamed skin conditions whilst providing a skin-protectant and barrier-enhancing benefit to help repair and protect a compromised epidermal barrier.